bookity boo: This Lullaby won't put you to sleep. This Lullaby won't put you to sleep. 'But we wake from sleep,' I said. Lullaby has been sitting on my to-be-read shelf for a while, calling out to me with its beautiful, promising cover art. When I saw it in the store, I knew nothing about it other than that it was by Bernard Beckett. That was enough to tell me that a) I should buy it, and b) I'd want to read it fast. On the weekend, I got my moment. I started Lullaby in bed before breakfast, continued it in the car on a brief drive, read a little more as I iced an ankle injury, and finished the last fifty pages pedalling furiously on my stationary bike. 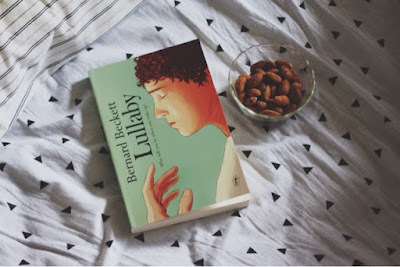 Reading in a condensed period worked well for this novel because, like Genesis before it, Lullaby is largely comprised of one extended conversation, a conversation between a psychologist, Maggie, and a young man, Rene, whose identical twin brother Theo lies hooked up to life support just a few rooms away. Theo's brain is dead but his body lives, and Rene is being assessed to prove his emotional fitness to make a decision about Theo. But this is Bernard Beckett, and so the decision Rene has to make is not the one that immediately springs to mind. Bernard Beckett is the master of the psychological twist, the unexpected realisation, the moment of crushing self-awareness or revelation. Lullaby is deeply philosophical, spare, and even clinical in spaces, yet incredibly emotive. Rene's conversation with Maggie is as taut and compelling as any thriller, and I read it breathlessly, greedily. The twists are perfect, gentle yet powerful. And the final pages are genius. It's hard to talk too much about plot without giving things away, so I won't say any more. Lullaby defies easy categorisation, but to me at least, it reads more as an adult text than the YA under which it is sold. Regardless, it's original, thought provoking, and dotted with moments of slow-dawning realisation. Really good.